Efflorescence is the unsightly white film or buildup that grows on your concrete walls or concrete pavement. It can be as minimal as a light haze or it can be a heavier accumulation that has the appearance of snow on the surface. Rest assured the occurrence of efflorescence is a natural phenomena and not the result of careless construction practices by you or your contractor. All concrete products, whether made by a concrete block manufacturer or formed and poured on site, will be at risk of efflorescence occurring over time. Concrete products are made with natural ingredients that come from the earth. Sand, rock and cement in various proportions make up the mix design and these natural products contain salts that can work their way to the surface. More times than not, the efflorescence will appear after rain or close proximity to water, like landscape irrigation or fountains. Being that efflorescence is a naturally occurring substance which uses the salts within concrete product to form, it will continue to form until all the salts within the concrete are used up. 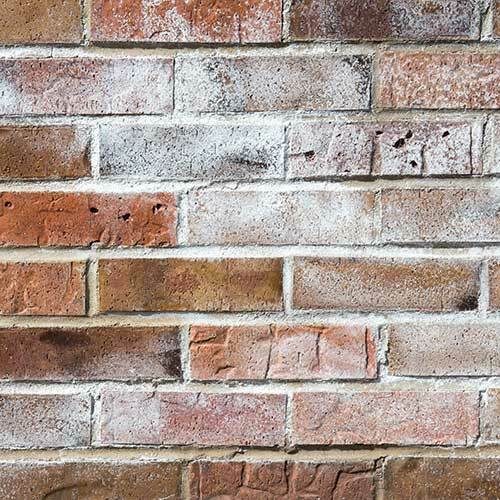 This being said, you can remove any efflorescence as it forms using one of our available masonry cleaners or efflorescence removers. For proper use, please see manufacturers application suggestions or contact an RCP Block & Brick near you for information. 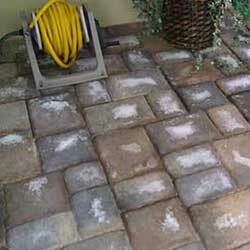 What Can I Do to Prevent Efflorescence? When building a traditional concrete block retaining wall with mortar, it is necessary to eliminate as much water as possible from penetrating the back of the wall. Protect the back side of the wall with a waterproofing membrane. There are many products available and RCP Block & Brick. RCP stocks those products that the contractors and pros have found to get the best results. If you are retaining soil with concrete block or Keystone Retaining Wall “mortar-less” units, always follow proper retaining wall installation techniques and back-fill behind the wall with ¾” crushed rock and install a minimum 3” perforated drain pipe at the bottom of the wall in the crushed rock zone. This will allow water that is trapped behind the wall to work its way down to the drain pipe and be transferred to an outlet. If you are constructing a patio, walkway or other permanent surface using RCP’s concrete interlocking pavers you will need to first install a minimum of 4” of good compactable base material that will not be compromised by the intrusion of water. (View Guide to Proper Paver Installation) Once the pavers and joint sand has been installed over your base, and the surface completely cleaned you will want to seal your paving surface with one of our sealer products. Two very important things to remember when sealing your pavers is to allow the surface to be completely dry before installing the sealer and review all the manufacturers recommendations on the label. If the surface is still damp when a sealer gets applied you will incur a haze over the project. It is always a good idea to seal a small, inconspicuous area prior to sealing the entire project to insure best results. Many projects will also include some plants, shrubs or grass to complement your RCP Block & Brick hardscape. Consider the placement and direction of irrigation sprinkler heads prior to installation to eliminate substantial amounts of water soaking your wall or pooling on your pavers.